Homeless Lady. By Sean Thomas, Sacramento, U.S.A. Published April 11, 2014 at 1600 × 1066	~ Post a comment or leave a trackback: Trackback URL. 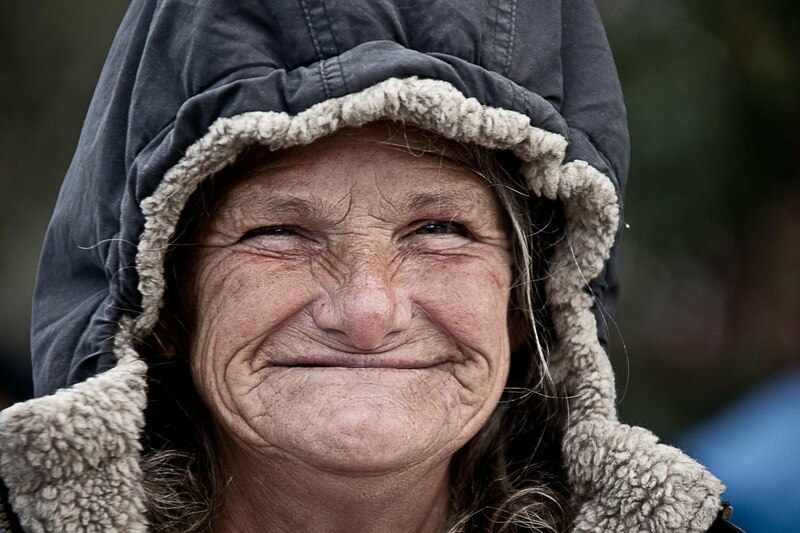 Many thanks to Sean Thomas for this endearing photo of a homeless-but-happy lady. Thank you Eve. I like the lady’s eyes; it’s as if they see through her homeless plight to something of great value. Thanks for looking and all best wishes, Hariod. Are you so certain that she doesn’t just pose for the camera? I sense a sadness in the smile. My guess is that in that moment she is happy in some degree. Sadness and happiness are transient feelings, and I imagine she feels far more of the former than the latter, given her situation and what she is likely to experience as a result of it. Even those suffering clinical depression have fleeting moments of happiness. It is quite hard to smile and be sad simultaneously, don’t you think? Though I don’t disagree with your main point, you ask your question of the wrong person. Smiling and being sad together comes easily to one with permanent Bell’s Palsy. Are many of your facial expressions affected by the condition, then, in the sense of making them difficult to use as means of communication? Indeed so. The ‘smile’ being the classic: it’s a grimace. And: no, I’m not winking at everyone all the time. Does it get tedious explaining verbally each nuance you wish to convey, and which otherwise you might do with a facial expression? I pretty much resigned myself to being misunderstood most of the time, long ago.